being little • bristol uk fashion & lifestyle blog. : day one : giveaway. You may or may not know, that one year ago today I first posted on this blog. Yes, that's right. Being Little is one year old! I can't believe that in just 12 months I've gained just over 1200 followers. I appreciate every one of you! It really does make me feel so much better having people I barely know saying such sweet things about what I do. It's made me stronger, and encouraged me to do things I wouldn't have done otherwise. To show my appreciation, I have organised a MEGA GIVEAWAY, involving wonderful people and shops that I have discovered through blogging! A t-shirt of your choice from the boys at Total Jerk. This sweet little necklace from Ella at Velvet Feather. All of these nailvarnishes from Models Own. This lovely print and two postcards from Kerry at Seventy Tree. 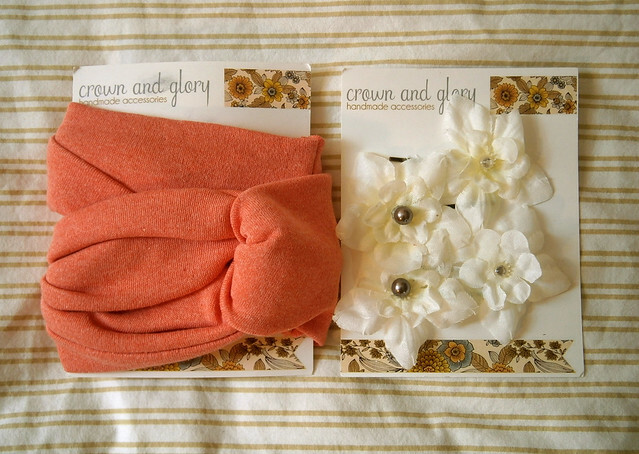 This lovely coral turban/headband and flowery hairslides from Crown&Glory! The packaging was way too pretty to unwrap, but I've seen a photo of the braccelet inside and it's adorable! From Louise at Wallpaper Rose. 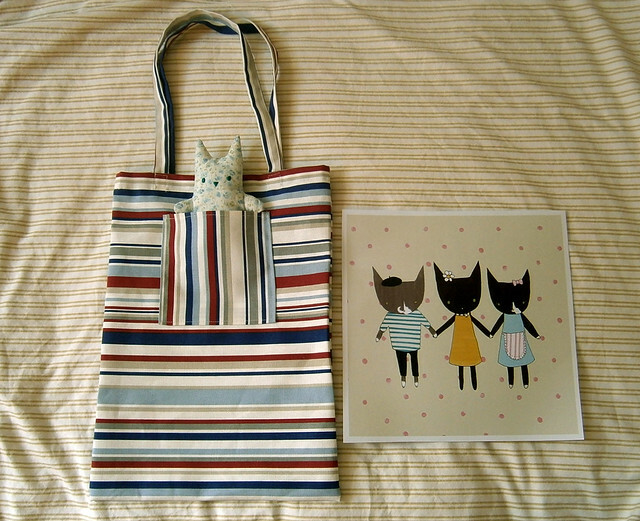 A handmade tote bag (with a POCKET!!!) little flowery kitty cat, and a print of an illustration I did recently. • For extra entries: post this giveaway on your blog, and leave an extra comment saying you've done so / tweet about it, making sure you include @beinglittle so that I can see it / like Being Little on facebook and leave a comment on the wall. This competition is open to ALL of you, including international readers! The winner will be chosen at random & announced on Monday 29th August! And, so you all get a little something, some of the lovely lot have given discount codes too! Congratulations, loving the little cake, looks yum! I liked/followed the shops etc. and will be shortly posting on your facebook group wall. WOW there are so many lovely prizes! Happy Blog Birthday Being Little! (lots of Bs there haha!) I follow via GFC as Whimsical Wolf. I followed everyone on twitter and/or facebook. I found your blog through Oli, whom I met while I was in Dartmouth for summer three years ago or so. (~loving the beach~) :) but i became "obsessed" with blogs only recently. now reading through beinglittle sort of backwards and loving it! thank you and good luck with your blog. I have followed all the blogs and liked them all on facebook. I have also liked Being Little on Facebook aswell. It all looks awesome, I'm going to enter because I've been following your work for 6 years now!! all the way back from when you were first on Deviantart (didn't realise it had been so long!) my email is clare@claremills.co.uk - happy birthday! Amazing! I've only just found this blog through Crown and Glory and what a lovely introduction to you! Happy Birthday to your blog! I'm following all the blogs/twitter! Of course, I already follow you :) Happy 1 year of blogging! What an amazing giveaway! Congrats on your one year Anniversary of blogging goodness! Happy 1st Birthday Being Little! Such wonderful items! Good luck everyone! Congrats on a year! I'm definitely glad I found your blog. Amazing giveaway! I left a wall post of Facebook :) And I follow all the blogs, liked all the facebooks and following all the twitters! And I tweeted about your giveaway here -http://twitter.com/#!/sweetaspiiie. Hii, can i just say you are quite possibly the cutest person, with the cutest blog. :) everything is so sweet here! i've liked & followed everything, plus those on blogloving too :) - such a lovely give away. posted about your giveaway on my blog in this here post! and have already entered before with the essentials and twittered youuuu :) just thought I would let you know! Enter me please. Following/liking the pages above. Wow, this is one heck of a giveaway! Many Congratulations on your success, which is totally deserved, this is a wonderful, joyful blog. i think I follow them all but will double check. This giveaway is amazing! I've followed and liked all of the companies & posted on your facebook wall. 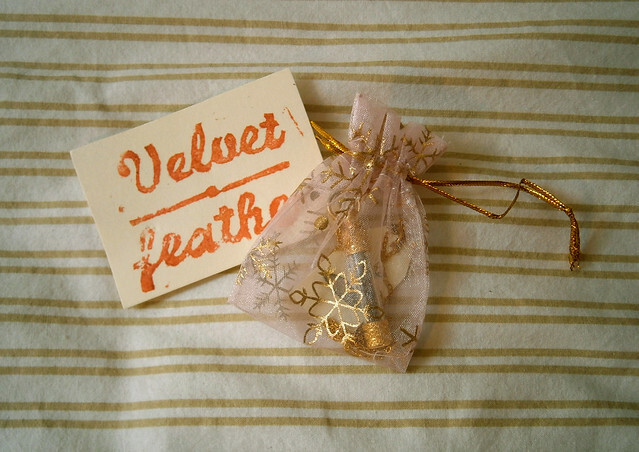 I especially love the Velvet Feather necklaces; they are all amazing! Congrats on making it to 1 years old. I've been reading your blog for about 4 months now so I missed the start of your journey. lyzi, this is the most amazing giveaway! such beautiful things, they all really reflect your blog too :) i need one of your kitties in my life!!! i follow them all and my email is skyepennant@hotmail.co.uk. Liyzi! This is like the best giveaway in the entire universe! Follow all of their social media's!! Please enter meeeee. 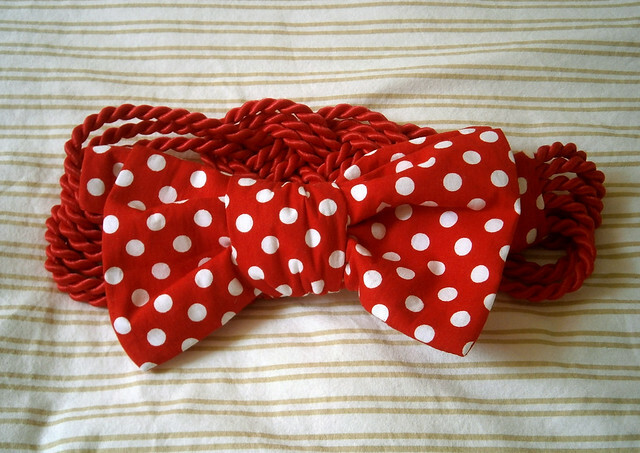 I have already been following @LittleFille, her headbands are amazing and now I am following all the other talented people you've suggested. Thanks! Congratulations Lyzi & Happy Birthday dear Being Little blog!! This is an amazing giveaway! I follow you and all of the shop's social medias! What an amazing giveaway, it must have taken you a while to put it together. Definitely need to make my first giveaway a little more exciting then I'd planned. Congrats on the amount of followers and one year blog mark. I'll definitely mention the giveaway on my blog. You certainly have started the party with this beautiful bundle of treats! thinking of starting my own blog after following yours and others! This is an amazing giveaway, thank you for organising it. I think I did everything! I liked/followed everyone as requested. Thanks for holding such a fantastic giveaway! Happy Blog Birthday! Thank you for this giveaway! What an amazing giveaway! I follow via GFC (Erin El Issa) and I followed all the others either on Twitter (toblushornot17) or Facebook (Erin Al Essa). Extra entry 2: I liked on Facebook and commented (Erin Al Essa). This is a mind-blowing giveaway.....I am following all the above blogs, facebooks and Twitters. This is EPIC. I have followed you for a while and your blog is a joy to read and nose around :) I have also tweeted your giveaway. Gorgeous giveaway! What a generous prize! Great to see such lovely crafts. Followed you, tweeted you, followed the gift makers and commented on your facebook. oh gosh this is an amazing giveaway! i've followed all the blogs/liked all the facebook pages/and follow all of them on twitter! happy birthday! i seriously LOVE your blog :) such a kind giveaway! i shall be following your blog in the future! I follow your blog and i've liked/followed everything. Happy birthday! I'm loving this giveaway! I followed you via GFC and followed the others on facebook/twitter. 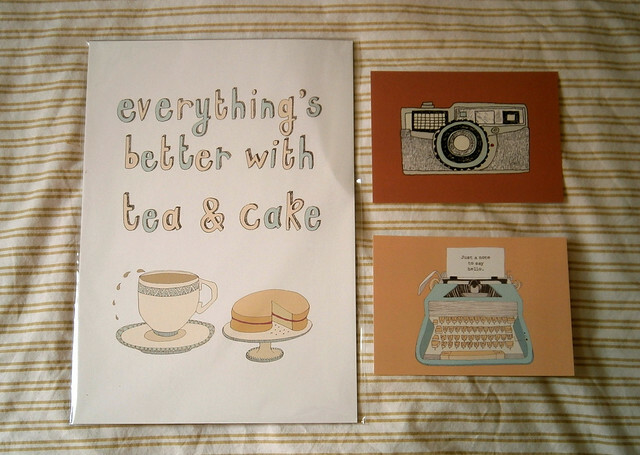 everything really IS better with tea and cake! This is such a lovely giveaway. I've followed & liked everyone. I've followed and liked. check. Hey, I've followed all the blogs all this stuff is amazing! I'd love to enter, I am following all the links, as rafflesbizarre on Twitter and Jess Heath on Facebook. Wow that looks fantastic! I've followed, liked, etc. That floral kitty is so cute, I love cats and I love floral! this is genuinely one of my favourite giveaways.. it seems so personal and genuinely you, love it! following all the links on twitter, etc. my email address is rebecca-w@hotmail.co.uk! Thanks for this amazing giveaway again! This giveaway is amazing and you hair looks so nice in that picture! I'm following them on twitter(@elnrsmith)/facebook(Eleanor Smith) and I follow your blog. 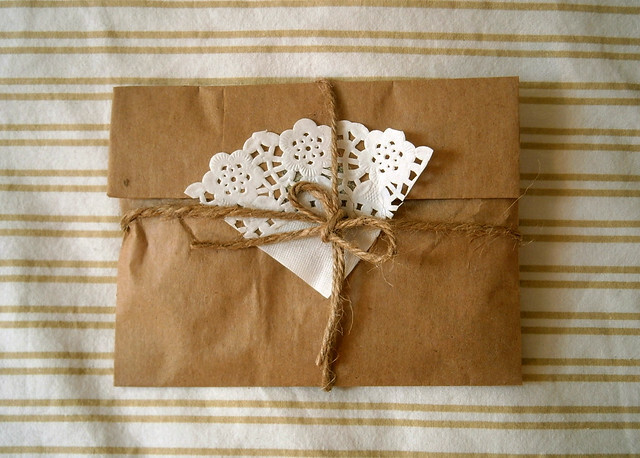 what a lovely idea and a beautiful giveaway! i'd be honoured to win Lyzi! you're such an inspiration, reallyreallyreally. and glad to see things are looking up for you! this giveaway is perfect!! following everyone and everything! happy blog birthday to Being Little too! 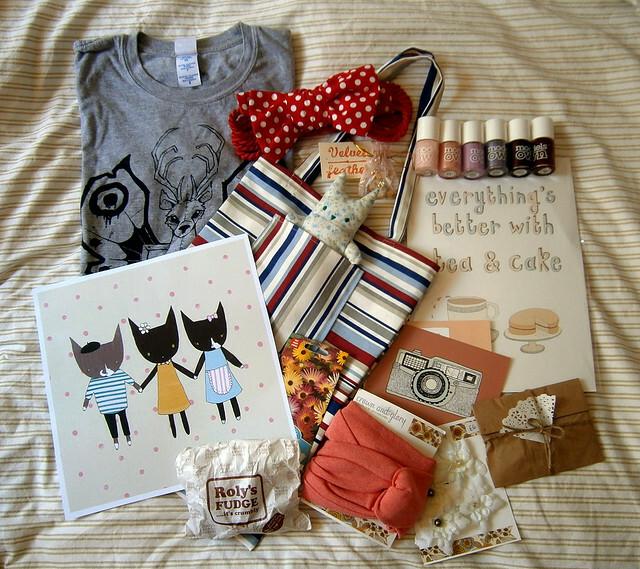 @beinglittle has a wonderful giveaway! check it out! Gahhhhh, beautiful giveaway to die for! Got a little worried for a sec there that i hadn't entered in time! Phew..
Wow, such an amazing giveaway! I'm following all either on Twitter or Facebook :) even if I don't win thanks for sharing such lovely stores, they'll definitely come in use for future gifts! Finally. Been trying to leave this comment for ages! You always make me crave cakes. Definitely need to stop off and get a cupcake in town today now. i was already following most of these but have just made sure im following all of them. have followed the blogs and liked all the pages! Wow what an amazing give away! and a very happy 1st blogger birthday, it's been great reading all the things you have to say! Amazing Giveaway! I would love to be entered. I have 'liked' everyone on Facebook and also have followed them on Twitter. I tweeted about it and I am just away to blog about this amazing Giveaway! Following and liking all! Happy anniversary! congrats on your blog birthday! my blog is in the making, i hope it will be as lovely as yours one day. oh, how i'd love to win this giveaway :) liking and following all. oh and i left a comment on your facebook page! what a fantastic give away, Happy blog birthday. Congratulations! I really love your blog, one of my favourites. I'm a bit new to the whole blogging world so am still a bit scared to comment (sad I know!) but this giveaway was so gorgeous I had to enter! I'm also going to tweet about this and like the facebook page! What a massive giveaway... just a-maz-ing! And I genuinely enjoy reading your blog. why have I just stumbled across your blog. I'm in love with it. The pictures you take are beautiful, you're beautiful too! From looking through you've had amazing success after one year :-) well done! Hope you're well! This is the best giveaway i have ever seen, ever! Thank you for your amazing chance to win! 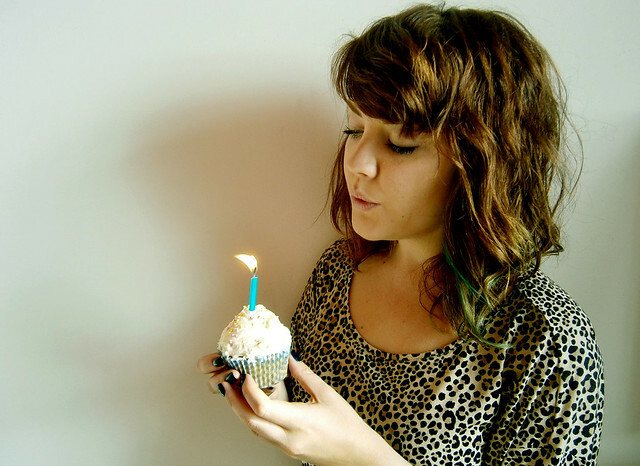 happy first birthday to your blog! Happy first birthday to the blog, congratulations! What an amazing giveaway. I'd love to win even one of these items, so beautiful! Wow! This looks like an awesome giveaway! Happy blogoversary! I would love to win all of this! This all looks lovely! Happy Birthday to your blog! It must be sucha wonderful feeling. I've only jsut started mien and cannot wait until I've been up and running for this long. Congratulations, i love your blog! I've followed the companies on Facebook as Georgia O'Brien-Perry, on Twitter as @ohheyimgeorgia and on here through google friend connect as this account. Oh yeah I liked on facebook as Lisa Merriman, twitter as lisamello, and through this blog, sorry for the third post!